The river/stream once served as drainage for the city of Seoul until the 40’s. During this time the stream was getting polluted and people began filing it in with concrete. This continued until there were parts of the stream left and in 1976 an elevated highway was formed on top of the filled in corridor. The highway stood there for 27 years until the city planners decided to tear it down to make Seoul more environmentally friendly. 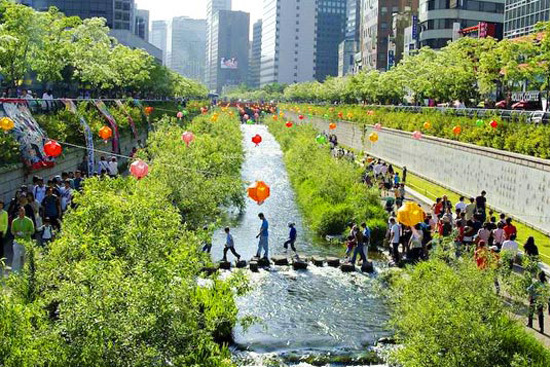 The project, known ad the Cheonggyecheon Restoration project is praised for transforming a busy highway into a safe walkable park located in the center of the city. The park is not only looked at as being walkable in itself, but it serves to connect the north and south parts of the city together. The highway once divided them but the new park bridges this gap and better connects the city. Another green part of the project was that over ¾ of the concrete torn down form the old highway was able to be used in the new park project. As part of the urban renewal project Seoul also increased the available public transportation and re-routed the traffic that once relied on the highway. As a result, there is less traffic in the city and more people walk and use busses and subways.